On Saturday 30th March 2019 our QTH The Post Mill Centre hosted a Viking Fest and the club were asked to operate a station which we were pleased to do. Unfortunately we could not contact the long boats before they set sail but welcomed them on the day. With Svartland Viking Workshops, Viking Combat Viking Falconry, Crown a Viking and a Viking Hog Roast made it busy event and a really enjoyable day out. Mel M0RNU, Barry G4PCL and David 2E0DAO set up outside in a suntrap and were distracted by the aroma of the hog roast. They were joined during the day by Alan M0OLT, Dennis M0DEN and Nigel G6MRN. The HF bands were totally swamped by an International competition but several QSO were made on 2m including some long interesting chats. The next club event will be a day out at Crich Stand on Saturday 20th April. Every Tuesday from 18.45 Hrs ish till ? 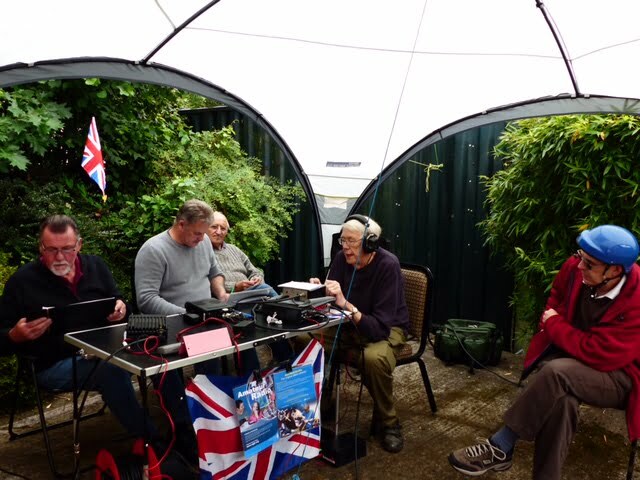 Another successful ‘Junction 28 Radio Rally’ was organised on Sunday June 10th by South Normanton, Alfreton and District Amateur Radio Club (SNADARC). The good weather must have brought people out even though it is an indoor event as 40 people were queuing by 08:30 and by the time the doors opened at 10:00 it was nearer 300. With over 400 people milling about it is no wonder the sandwiches sold out twice. The committee would like to thank all the traders and visitors for their support again. With 45 stands using over 100 tables there was something for everybody from vintage to new technology, TV, SDR, microwave etc. Plenty of those hard to find components, antenna, masts, cables and connectors, chips to coils plus all the books and magazines to find out how to use them. Local and national clubs with RSGB, RAIBC and BRARS brought hams from far and wide. New this year were Sotabeams, M0CVO and hifiSSB with lots of our regulars. Many people commented on the friendly atmosphere plus a bar and meeting areas and most got their bargains. The club managed to make a profit so guess what. We are doing it all again next year. Get it in your diary now Sunday June 9th 2019, ten minutes from M1 junction 28. If you want a table book early as some late applications were disappointed. Saturday July 1st 2017 meant our members were operating another successful Special Event Station at our QTH. South Normanton Gala was registered as GB1PMG (Post Mill Gala). Apart from enjoying the showground events and most succumbing to the aroma of fresh made chips (not of the silicon type! ) 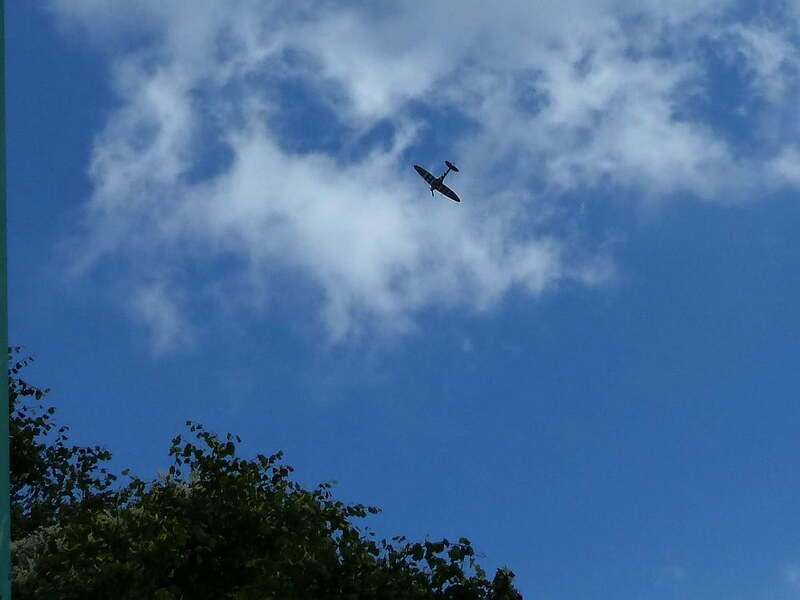 we were treated to a Flypast by a Spitfire in D-Day livery. Beautiful weather meant an enjoyable day for all. Mel M0RNU and Ray M0TVX started operating both HF and 2m stations but once again, even with the new G5RV, had no success on HF so concentrated on 2M with a steady stream all day. David (2E0DAO) set up a display and demonstration of CW equipment and Royal Signals QSLs. Barry G4PCL operated his QRP rig and was able to successfully test a new G-QRP antenna tuner. Lyn G0NNU tested his new HF vertical antenna with a new mobile stand. Tony 2E0TNY and Alan M0OLT also spent most of the day with Simon G4VAX joining for a few hours in the afternoon. 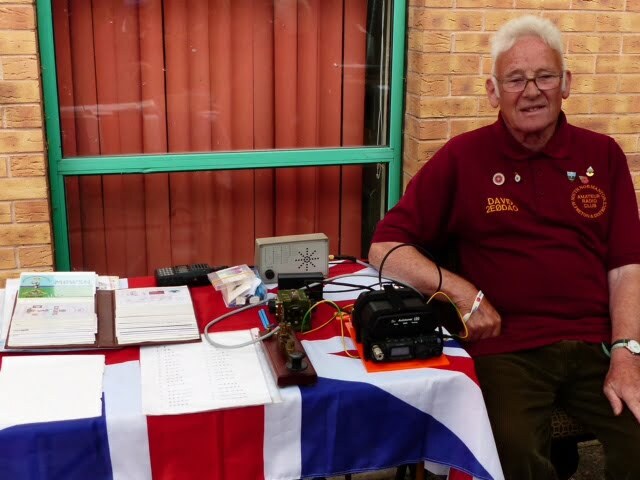 SNADARC have been attending the South Normanton Gala every year and we use it as an opportunity to promote amateur radio to our local community. We will be operating another special event station with the call sign GB1CSR in August at the Cromford Steam Rally. We look forward to seeing you there!